In just four years, bike share has gone from being the fantasy of a few enthusiasts to a practical and low-cost way for tens of thousands of people in cities, both large and small, across the U.S. to get around. While some cities have created their own bike share systems, many have partnered with Alta Bicycle Share, a company based out of Portland, Oregon. Alta runs bike share systems in New York City, Washington, D.C., Boston, Chicago, and Chattanooga, really inventing these systems as they go. Like many start-ups, Alta Bicycle Share has never turned a profit and has also gotten blasted in the press for hiccups in the roll-out of its services (see the ongoing complaints with CitiBike in NYC). But Alta Bicycle Share was recently acquired by outside investors, and Jay Walder, the former head of the New York City Metropolitan Transit Authority (MTA), will soon become the new CEO. According to Alta Bike Share founder Mia Birk, who spoke at Washington Ideas Forum, an event organized by The Atltantic and the Aspen Institute, this move is for the best, as “this new group can take us to the next level.” Birk said the acquisition signifies bike share is moving from niche into the mainstream, from being a start-up concept to a legitimate transportation option. 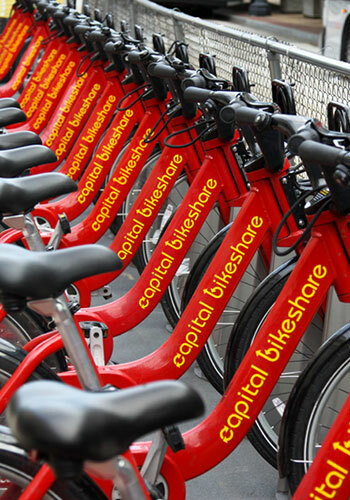 While major bike share systems like Washington, D.C. and NYC’s get all the press, Birk said there were actually 35 systems running in the U.S. Some smaller cities’ systems may just have a few hundred bikes. For example, Salt Lake City has GREENbike. Indianapolis has started its Indiana Pacer Bikeshare, and San Antonio, Texas, has also gotten on board. Ya se está desarrollando uno para Puerto Rico!! I really don’t think this is true. The overwhelming majority of the bike commuters I see, both around town and on my own daily commute, are not lycra-clad adrenaline junkies. Maybe that’s because I live in Boston, and Boston’s unusual, but on the other hand it’s places like Boston where there are the most commuters. The bike racks at my workplace are overflowing with bikes, and virtually none of them are the kind of bikes you wear lycra to ride.